Have you ever wanted to move house…literally? Ten Fold Engineering offers you a portable house, ready to unfold and ready to use in just ten minutes. Tired of your new surroundings? You can relocate again, and again…and again. Prices start from £100,000 and the future housing potential of such a system is unlimited in such a fast-moving demanding world. The Ten Fold initiative innovates by creating and designing various relocatable buildings and structures. Its enormous self-deploy mechanism generates various combinations of space and facilities and it works by using a hand-held battery-powered drill. Different designs have already been imagined in order to meet the needs and desires of the customers, but the process is fully reversible, whenever you feel the need for a change of scenery. Foundations, builders or cranes are not required, and the 8-minute self-deploy system can offer 64m2 of mobile space and 20m3 of storage, unloading and unfolding from a standard truck. The structure is ultimately easy to run and to maintain, it is fully equipped and powered up from the very beginning and it is also stackable and connectable in order to form larger structures. The shelters that are unfolded into the final structure are easy to operate, rigid, strong and sustainable, while the entire building is easily adaptable to the environment. The business opportunities and the applications of this system are virtually unlimited. Besides your regular home, the Ten Fold mechanism can offer bridges, huts, solar panels, lorries, antennas, stairways, larger halls or road barriers. Mobile shelters for film crews, festivals, sports events or leisure could also definitely be additional uses. 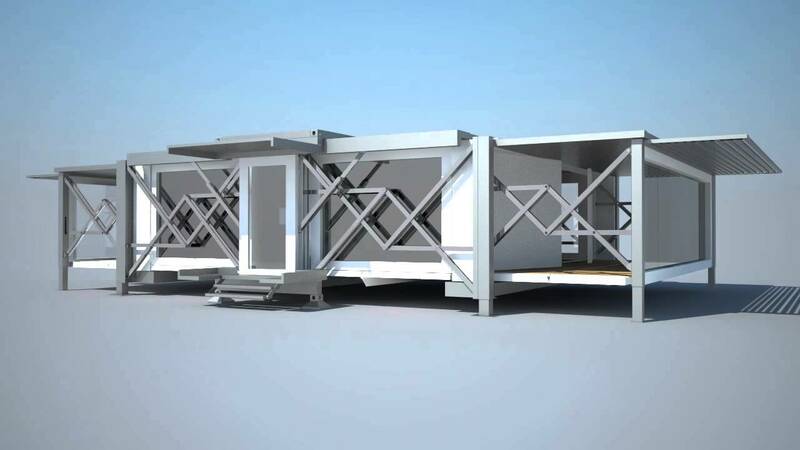 Besides representing an entirely innovative concept for mobile housing, it also represents an opportunity for mobile hotels or portable construction structures, providing the owners with increased safety and agility. We could live, in the future, in a world of lever systems, folding technologies and assembled buildings. In that sense, Ten Fold promotes speed and simplicity, flexibility, sustainability and futuristic designs. Ultimately, besides the various applications, the products that are affordable, adaptable and ready to use, such an innovative system can offer not only housing opportunities but also business opportunities for everybody. It can, as its slogan says, engineer new freedoms.